Do you often watch out entertainment content on your Television and are looking for a mesmerizing experience from the LED TV in your home? You are at the perfect place where we bring you the list of best 4K LED TVs in India 2019. This list consists of LED TV from brands like LG, VU, CloudWalker, Samsung, Sony and Kodak with all the different price points like under 30000, under 40000, under 50000, under 60000, under 70000 and under 80000. The best 4K LED covered here have a screen size of 43 Inch, 50 Inch, 55 Inch, and 65 inches. Depending on your room size and budget you can choose the best tv that suits you. Let us first tell you a bit about the 4K or the Ultra HD Display. It is the topmost panel of display and comes with a resolution of 3840x2160p, this is 4X of what a 1080p Full HD displays delivers. This Ultra HD or 4K display has vibrant colors, sharp images, and lifelike experience. Let us now take a look at best 4K LED TVs in India 2019. In this list, we have listed brief review, features, specifications, pros, and cons of all LED TVs. This is LG AI ThinQ series LED TV with a 55 inch IPS display having 4K (Ultra HD) resolution with 3840 x 2160 pixels. The LG quality is amazing and this TV also offers some great experience with perfect colour quality, sharpness, contrast and brightness. There are very thin bezels on the sides of the display which makes it look absolutely gorgeous. With its AI technology, this LG LED TV deploys a Natural Language Processing (NLP) where it understands your voice to execute various commands like switching on/off, changing channels, increasing decreasing volumes, launching any game or even looking up for things on the internet and many more functions, practically almost everything which you do manually with the remote, can be done via your voice commands. On this LG Smart LED TV, you have inbuilt WiFi and support for all the applications. You get easy to navigate buttons for Netflix to watch your favourite entertainment content. It even allows you to multitask by browsing the internet and watching the TV screen simultaneously, hence you will not miss any important scene if you thought of looking up anything on the internet in between. This LED TV also gets a scroll button on the remote which lets you hover over on the screen like a mouse. This LED TV allows you to cast your mobile screen to LED TV, and control it via the TV remote. You can also cast game from mobile to play on TV via TV remote. The sound quality is amazing on this LED TV and comes with dual 20 W speakers with DTS Virtual X technology and the experience of the sound loudness and clarity is amazing. This TV comes with 3 HDMI and 2 USB ports which are sufficient for day to day usage to connect external devices. At a pricing of under 90000, you get a 55-inch 4K display, voice support, superb audio quality system and a brand quality trust of LG. You can also look out at the Full HD variant of this 55 inch LG Smart LED TV. This is the 65 Inch LED TV which is the highest screen size television in the industry. It has a 4K Ultra HD display (resolution of 3840 x 2160) and an A+ grade panel that offers a detailed and great visual experience. The picture quality and color reproduction are aided by PureColor Reproduction technology. It runs on Android OS supported by a powerful processor for quick app launch and has support for various entertainment applications. You can download millions of other apps from Google Play Store which is preinstalled on this tv. This LED TV comes with features like screen share to cast or stream Youtube and Netflix content from a smartphone to the TV screen. It has Wifi and Ethernet connectivity and has 3 HDMI and 2 USB ports. It has 4 Speakers with a 30 W output that would easily mimic a theatre like an environment in your home. In terms of design, this TV has an aluminum metal frame design that adds a great look to this tv to suit well with the interiors of your house. It improves the viewing experience with features like Smooth Motion Rate, Ultra Dimming to provide sharp, clear and detailed images. It also has a Vu ActiVoice Remote which can be used to operate this tv via voice search. We don't have many televisions in the 65-inch screen size display and this is one of the best available under 70000. So this was the list of best 4K LED TVs in India 2019. We hope with our reviews, you would have been able to make a good choice as per your need and budget. Let's take a look at our favorite 4K TVs under various price points. Vu Iconium 43 inch 4K LED TV is our favorite under 30000. You can get it from Flipkart. 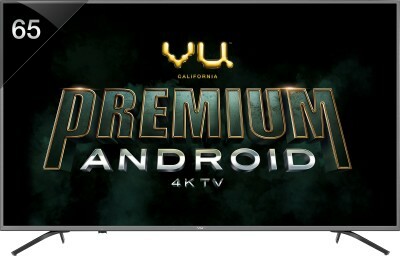 Here's the link: Buy VU 43 inch LED. iFFALCON 55 inch 4K LED TV is our favorite under 40000. It is also available on Flipkart. Here's the link: Buy iFFALCON 55 inch LED TV. LG 43 inch Ultra HD 4K TV is our favorite under 50000. You can get it from Amazon. Buy LG 43 inch 4K TV. VU is a good brand and they have some great value for money products. VU 65 inch 4K LED is our favorite under 60000 to 70000. Buy VU 65 inch LED TV. Also, take a look at our list of best LED TVs available in India under 25000.